One of the southern states of the United States of America; admitted to the Union in 1817. In 1682 La Salle took possession of the territory for the King of France. It passed to England in 1763, was ceded to Spain in 1781, and to the United States in 1798. In 1724 a law was passed in France by which "Jews were expelled, and no other religion [than the Roman Catholic] was tolerated." When the Spaniards took possession in 1781, a more tolerant government was established. It seems that there were a few Jews in the Natchez district at the close of the eighteenth century. At any rate, in Natchez a tombstone has been found bearing the name of Harris and the date 1828; and there are indications that of the several people of that name one had lived in the city a number of years prior to his death. It was about 1840 that the Jews had become sufficiently numerous to found congregations; the establishment of cemeteries usually preceded the formation of religious organizations. In 1849 three pedlers came to Woodville. One of them, Henry Burgance, died the same year. Loath to have their companion buried with Christians, the other two, Jacob Cohen and Jacob Schwarz, bought a small piece of land for $50 and founded a cemetery; this is still used. 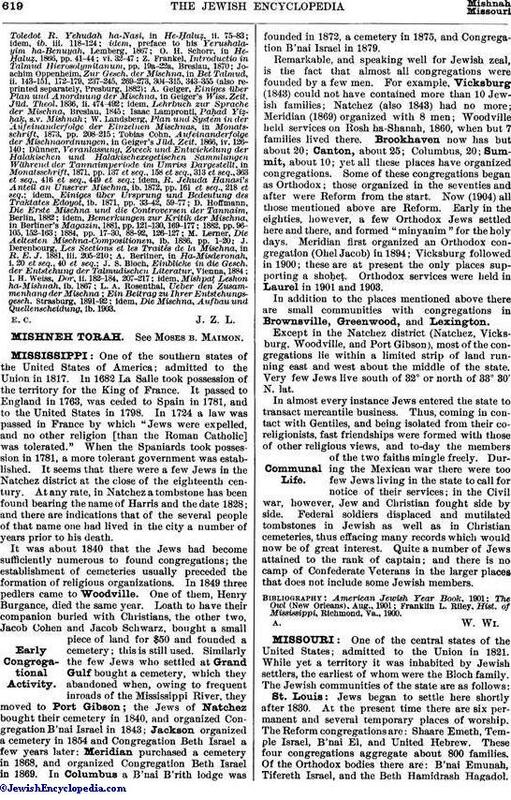 Similarly the few Jews who settled at Grand Gulf bought a cemetery, which they abandoned when, owing to frequent inroads of the Mississippi River, they moved to Port Gibson; the Jews of Natchez bought their cemetery in 1840, and organized Congregation B'nai Israel in 1843; Jackson organized a cemetery in 1854 and Congregation Beth Israel a few years later; Meridian purchased a cemetery in 1868, and organized Congregation Beth Israel in 1869. In Columbus a B'nai B'rith lodge was founded in 1872, a cemetery in 1875, and Congregation B'nai Israel in 1879. Remarkable, and speaking well for Jewish zeal, is the fact that almost all congregations were founded by a few men. For example, Vicksburg (1843) could not have contained more than 10 Jewish families; Natchez (also 1843) had no more; Meridian (1869) organized with 8 men; Woodville held services on Rosh ha-Shanah, 1860, when but 7 families lived there. Brookhaven now has but about 20; Canton, about 25; Columbus, 20; Summit, about 10; yet all these places have organized congregations. Some of these congregations began as Orthodox; those organized in the seventies and after were Reform from the start. Now (1904) all those mentioned above are Reform. Early in the eighties, however, a few Orthodox Jews settled here and there, and formed "minyanim" for the holy days. Meridian first organized an Orthodox congregation (Ohel Jacob) in 1894; Vicksburg followed in 1900; these are at present the only places supporting a shoḥeṭ. Orthodox services were held in Laurel in 1901 and 1903. In addition to the places mentioned above there are small communities with congregations in Brownsville, Greenwood, and Lexington. Except in the Natchez district (Natchez, Vicksburg, Woodville, and Port Gibson), most of the congregations lie within a limited strip of land running east and west about the middle of the state. Very few Jews live south of 32° or north of 33° 30' N. lat. In almost every instance Jews entered the state to transact mercantile business. Thus, coming in contact with Gentiles, and being isolated from their coreligionists, fast friendships were formed with those of other religious views, and to-day the members of the two faiths mingle freely. During the Mexican war there were too few Jews living in the state to call for notice of their services; in the Civil war, however, Jew and Christian fought side by side. Federal soldiers displaced and mutilated tombstones in Jewish as well as in Christian cemeteries, thus effacing many records which would now be of great interest. Quite a number of Jews attained to the rank of captain; and there is no camp of Confederate Veterans in the larger places that does not include some Jewish members. Franklin L. Riley, Hist. of Mississippi, Richmond, Va., 1900.